She gnawed her lower lip, thinking. It was the greatest challenge the dragonflights would face, but she did not know against whom they would be fighting. It might come soon . . . or aeons from now. Could it have something to do with the return of Deathwing? Surely it had to . . . did it not? This breaking of the world was one of the worst things that had ever happened to Azeroth. How could she persuade others of the direness of the situation when she herself could not articulate it? She uttered a little noise of annoyance and frustration. One thing she knew for certain. There were many pieces missing from this puzzle, but there was one core piece that was necessary before any of the others could fall into place. It was a very strange piece, an unlikely one at best, and she was uncertain as to how he would fit in. She only knew that he had to. Ysera had seen him, floating in and out of her dreaming. She had thought she understood his role in things, but now, peculiar as it seemed, something—some inner certainty that even she did not fully understand—was leading her to think she had not seen the full breadth of his contribution to Azeroth. He was not a dragon. But he had the interests of the dragonflights in his heart—whether he knew it or not. He straddled worlds—but did not seek to rule or command or destroy them. He was unique. She tilted her head, let the wind play with her long green hair. Perhaps that was why he fit in. Even the Aspects were not singular beings, although each had unique abilities. Not one but five there had been at the beginning, when the titans had come and shared their power for the good of Azeroth. Four there were now, but there would soon be five again, when the blues determined how to choose the one who would lead them. But there was only one like this being. There was only one Thrall. 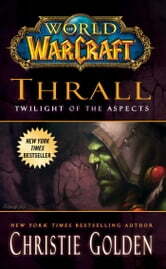 Retired & new to WoW came via love of Tolken got to say devoured every book. Wsh authors cold write as fast as I read.